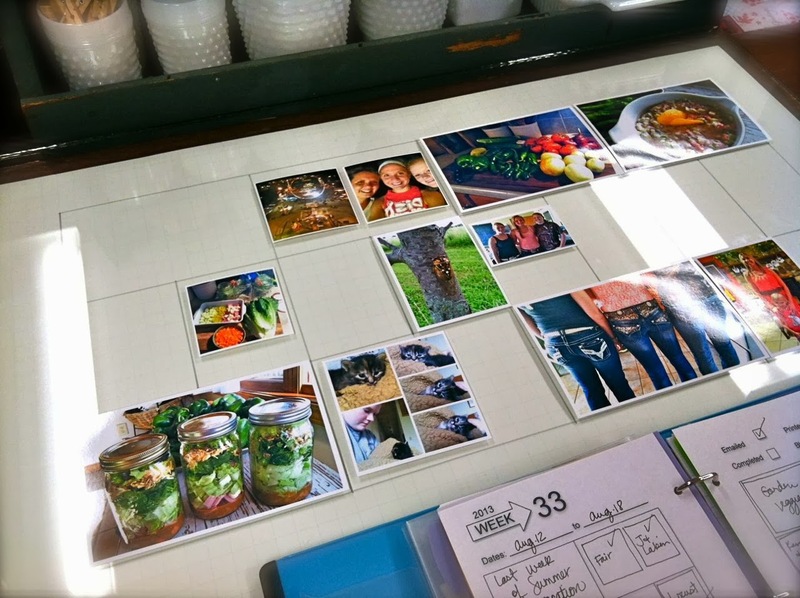 Today I'm back with some Project Life inspiration, sharing my Week 33. My family is missing Summer pretty badly around here. It just went by so very quickly it seems. We're already planning our next Colorado trip for next Summer with two other families. I dearly love looking back on my Project Life pages. It seems like when you're in the moment, working on photos, they seem so familiar.....but when a few months have passed by I start to look at the photos with more of a nostalgic point of view. Timeless treasures, these photos we capture. So here's my Week 33 sketch along with the photos I printed out. Note: My sketch pages are just for my own personal use and are not available as a download/printable product. Here is how I start laying out my week. All of the printed photos take their places first. Then it's on to the filler cards and embellishing. 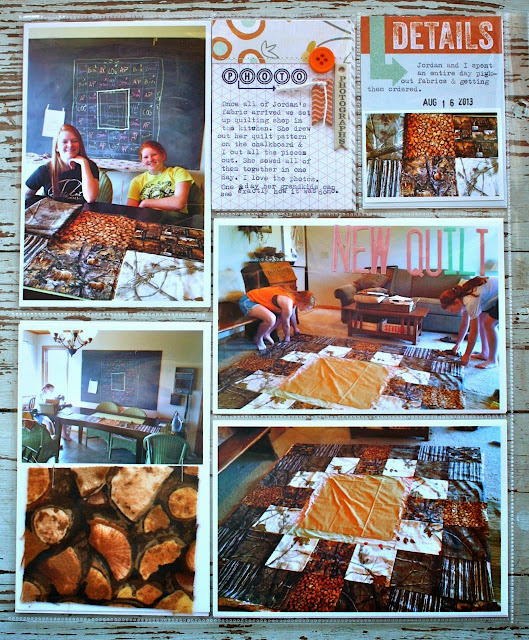 Here's my 2 page spread. 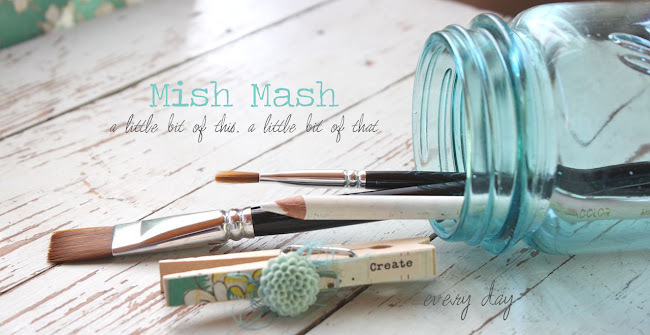 For this week I used products from the September Gossamer Blue kits. 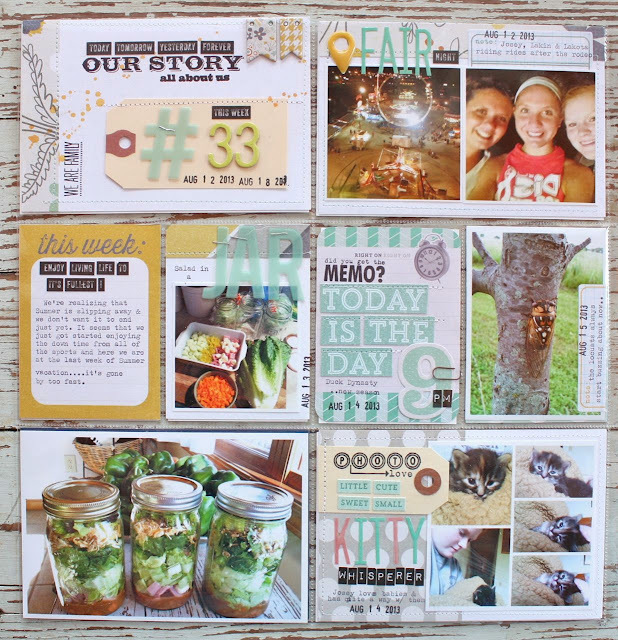 I remember feeling particularly scrappy while working on this spread so I used lots of embellishments, did lots of stitching and did a lot of tinkering around...treating each insert as it's own little scrapbook layout. Totally gives me my scrapbooking fix when I start to feel the pressure to create full size layouts. Here's the left page. 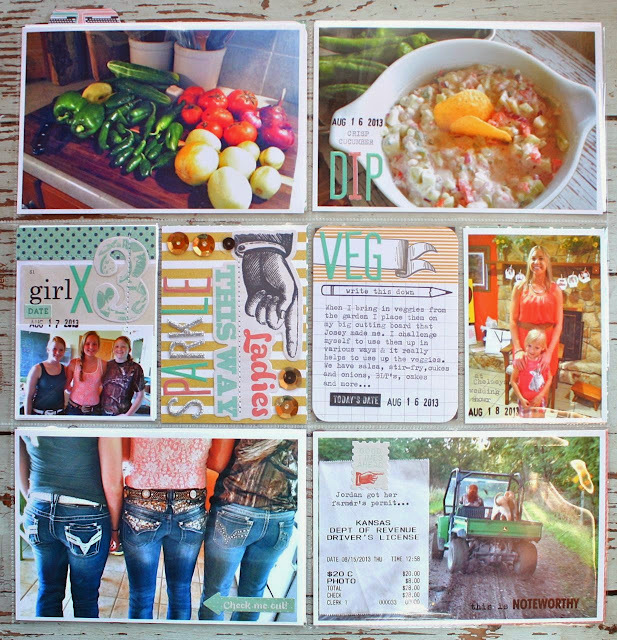 I love that there is lots of white space even though there are photos in nearly every slot. The right page. 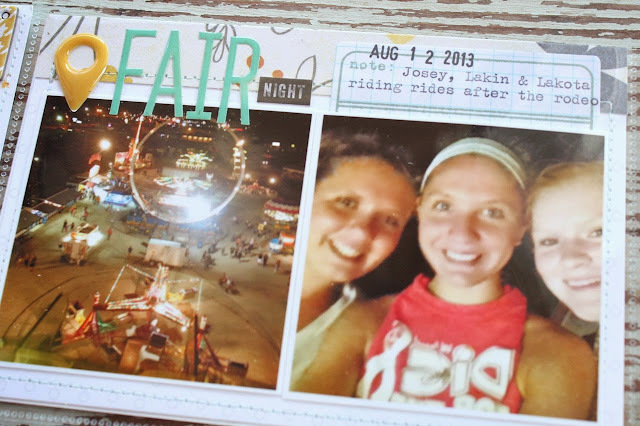 So many Summer memories coming back as I look at this again. Here's my main, dated insert noting week #33. As alphabet sheets get thinned out, you find creative ways to note the numbers and missing letters. 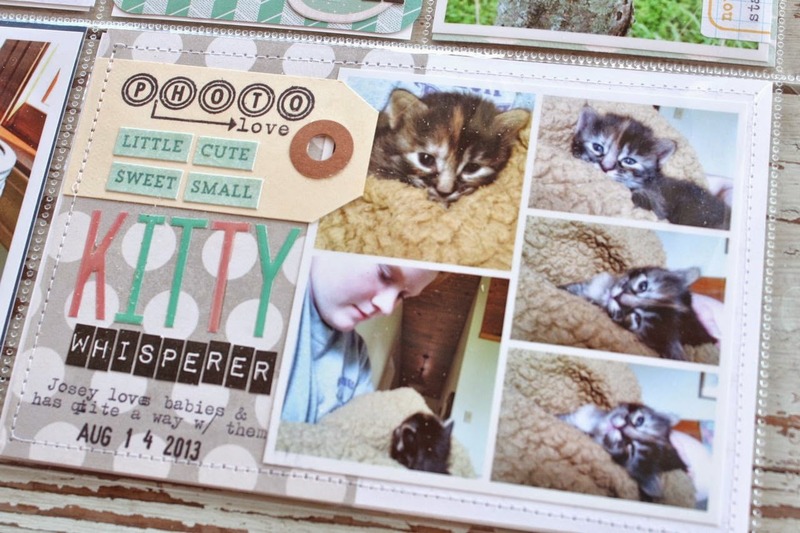 Here I mixed up alphabets, adding some stamping and word stickers and used the cute chipboard flags. A few ink splatters fill in some of the white space. Loved the alphabet and epoxy stickers from the September kits. Some of my faves. I'll still be using the label stamp from the September Life Pages Kit from here on out. 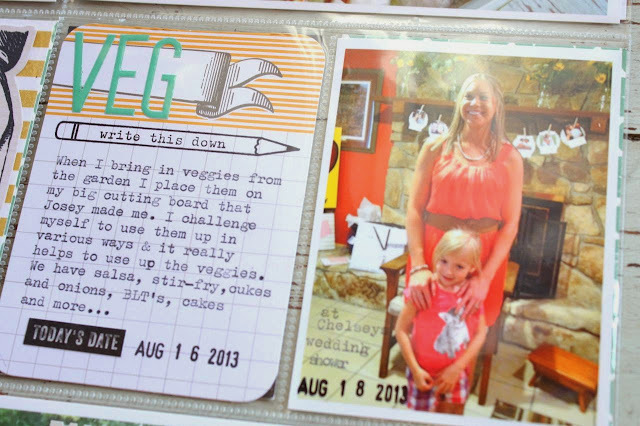 Here I typed my journaling and then tucked the label under the photo. 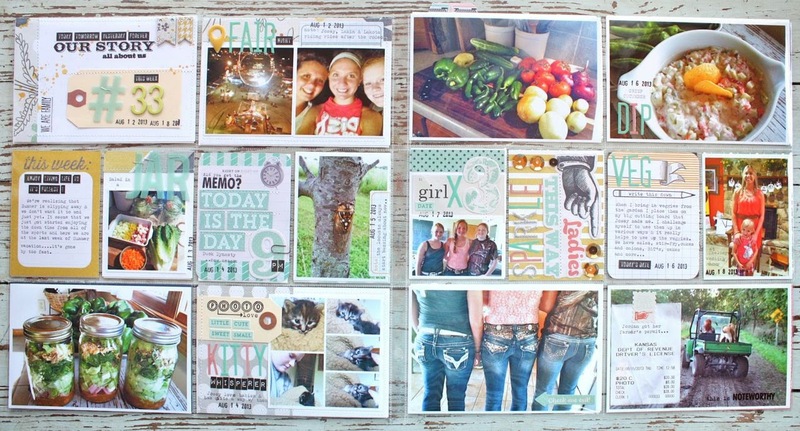 I used my Grid Paper Labels with green stamped ink. Here I used a cute photo I made using the Diptic app on my iPhone. Josey has quite the way with little kittens. She lulled this one to sleep in no time. 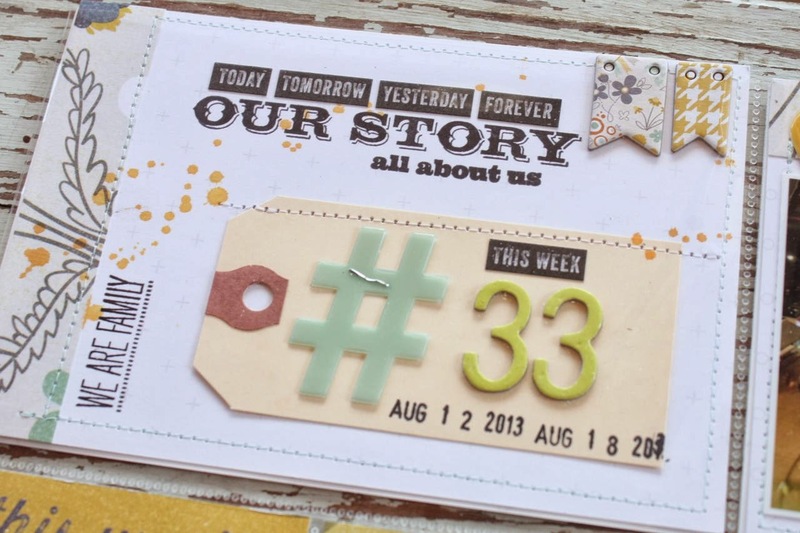 I used lots of stickers and a small manila tag + some stamps from the September kit. 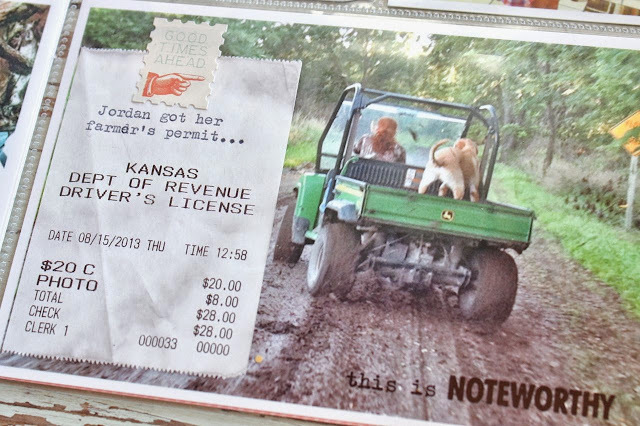 Jordan got her license so I taped it to a photo of her slinging mud in the Gator. Heaven help us. Here I typed my journaling on a Life Pages card, a little reflection about Summer slipping away. 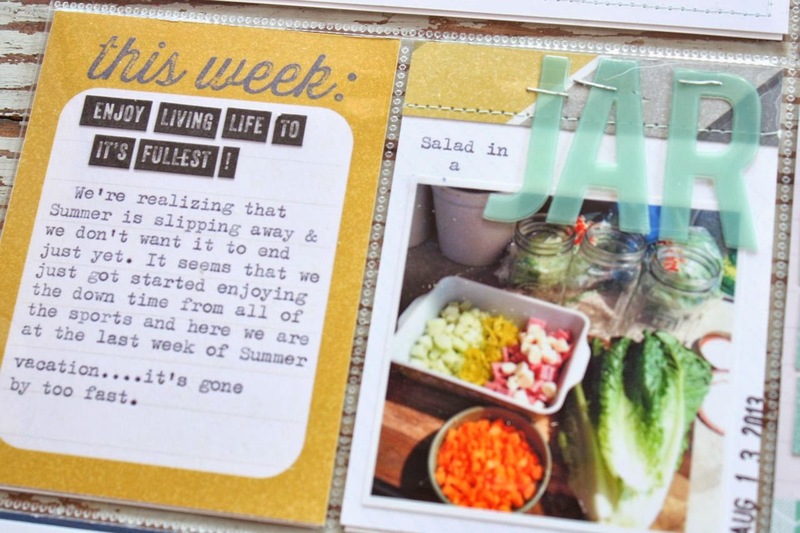 On the right I used the fun letters with my photo about salad in a jar. Lots of scrappy stuff going on here with stitching, stickers, stamps and those fun clips from the September Life Pages kit. On the right I captured a photo of a locust, or that's what we call them here. I used another Grid Paper Label with typed journaling and a date stamp. I loved piecing together the card on left, below. Girl x 3 for the girls and their friend, love it. 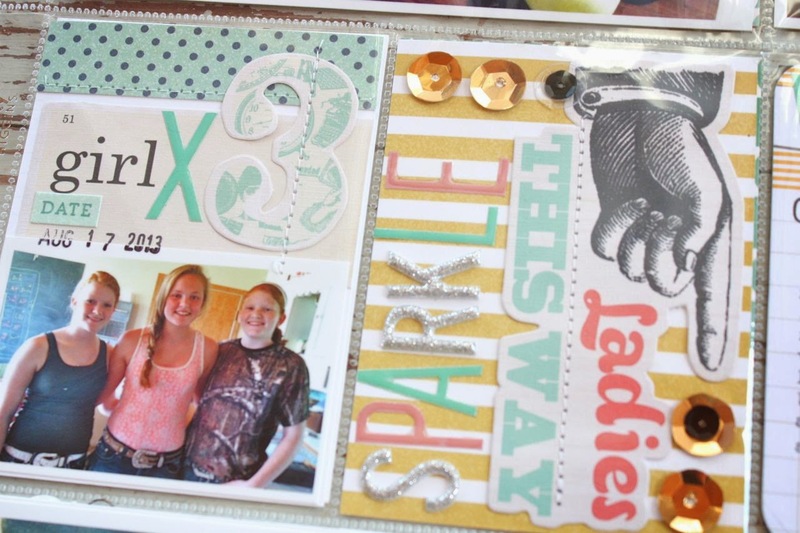 On the right I made use of leftover stickers and sequins to make a sparkle insert. 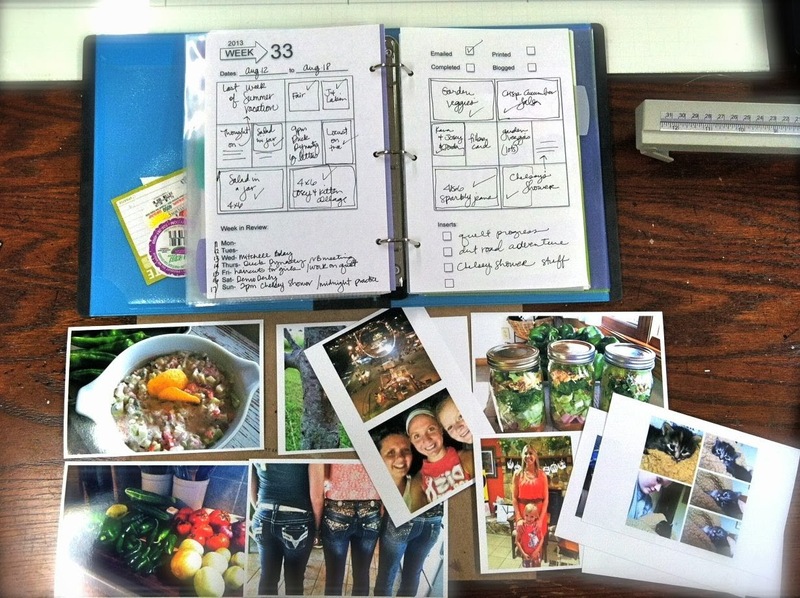 Below, the left card coordinates with a photo of all my garden veggies. 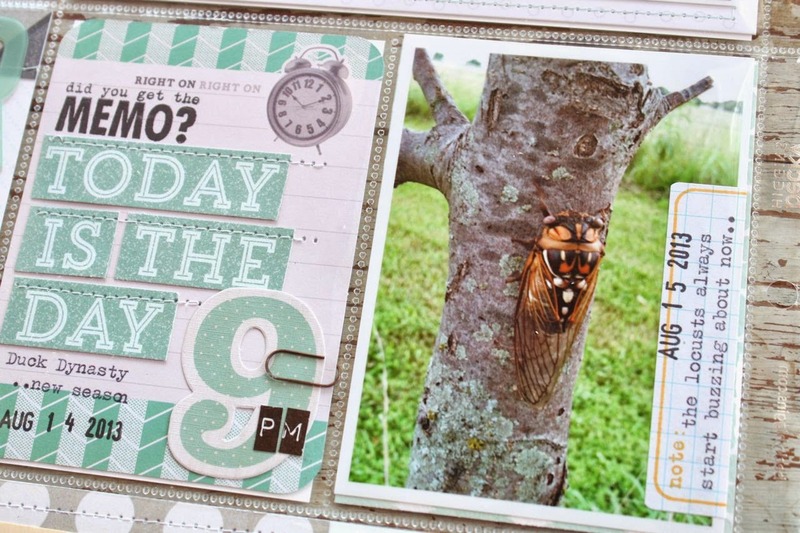 The pencil stamp is from the Gossamer Blue Life Pages Kit from September. Inserts for the week. First up is a 5 x 7 insert with my niece's engagement photo. Finally, a place to put all those single photos you get from wedding invites, school photos, xmas photos, etc. 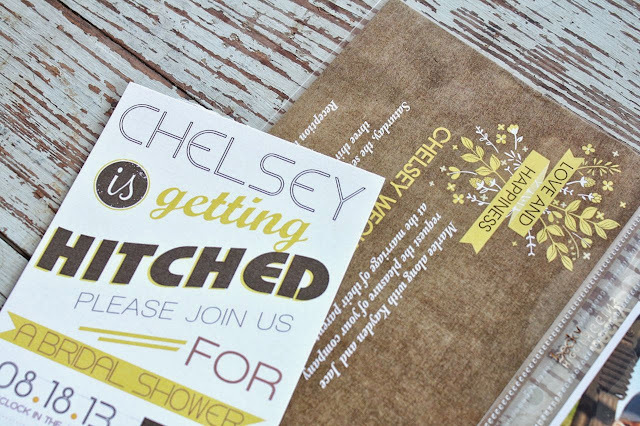 On the back side I included the wedding invitation and a bridal shower invitation. Just slipped them into the page protector, very simple and clean looking. 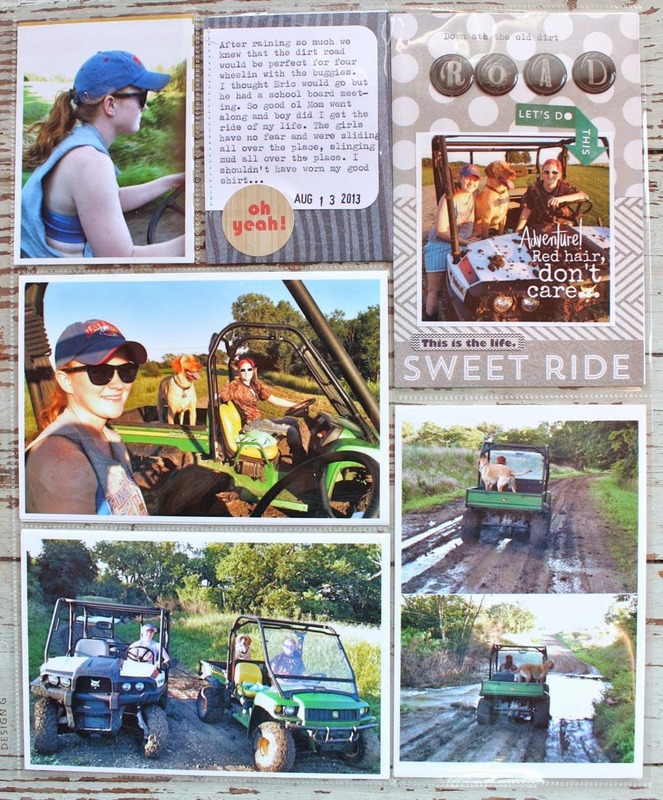 The second insert is of the girls having fun on the mud road with the Gator. I love using little pieces from the GB kits on inserts...it all coordinates with the weekly spread but in a mixy matchy sort of way. 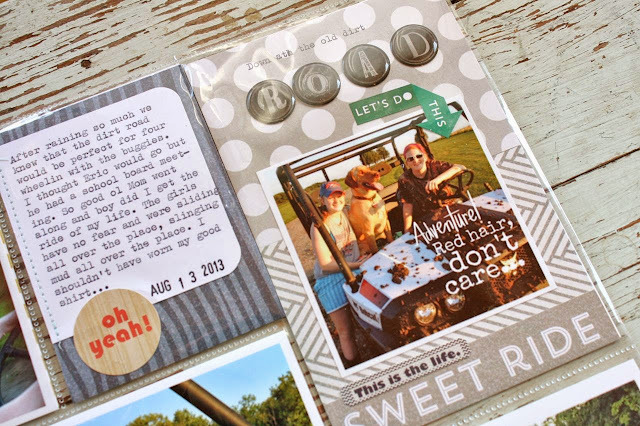 Lots of stickers to accent my journaling and photos. I used the A Beautiful Mess app to alter my photo. The back side of the insert is all about Jordan's camo quilt. The day we got the fabric in the mail, we cut out all the pieces and she had it sewn together within a day. That girl gets after it. The bottom left corner has an actual sample of the flannel fabric from the quilt. 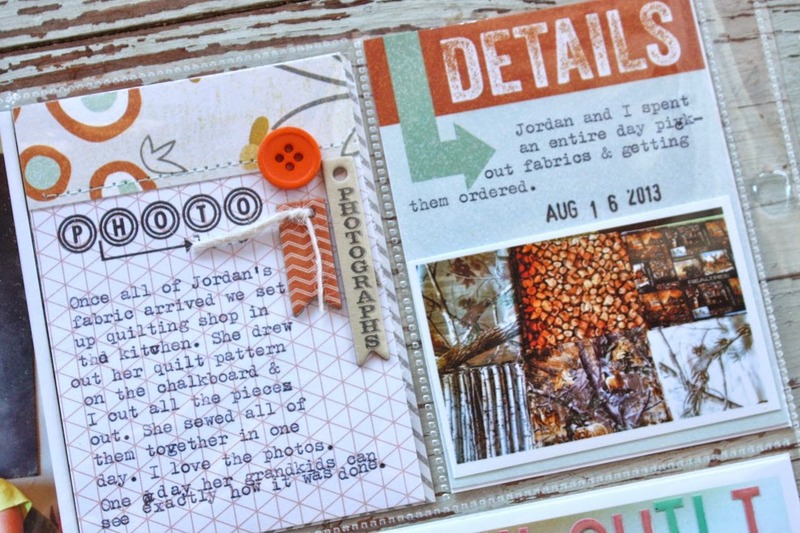 More September Gossamer Blue kit items for two small inserts. I love that we captured these photos. As a collector of old quilts, I'm always sad that I don't know the history of a quilt. 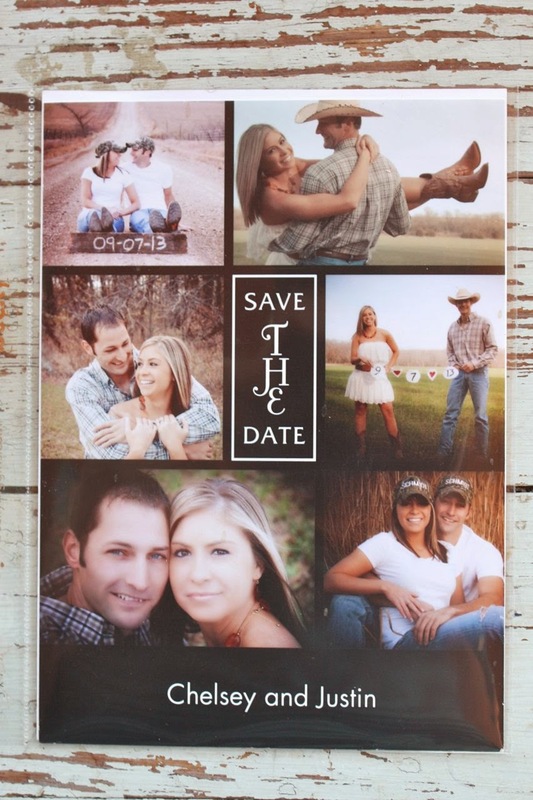 Here, we have documented the dates, photos, fabric samples and photos of the other fabrics we used. A little history in the making. We love the Camo quilt!!! 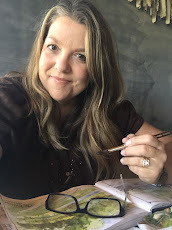 Can you share the sites you got your fabric from? Looking forward to your tips. My pl always gets neglected during November and December.